As outlined previously on this site and elsewhere in my writings, Jamaat Ansar al-Islam (JAI) is a jihadi group that originated in Iraq and expanded into Syria in 2011 thanks at least in part to the efforts of one Abu Muhammad al-Muhajir (an Iraqi himself who was later killed near Mosul while returning from Syria to Iraq). A rival of the Islamic State (IS) because it did not accept the statehood claims of IS or its previous incarnations, JAI tried to ride the initial rapid wave of IS-spearheaded insurgent gains in Iraq beginning with the fall of Mosul in June 2014 but soon found itself suffering from arrests, killings and defections at the hands of IS. By the end of August 2014, a statement had been issued in the name of JAI Iraq's Majlis Shura affirming the dissolution of JAI in Iraq and joining IS. Although this statement was denied by those controlling JAI Iraq's official Twitter account, it is apparent that the affirmation of allegiance to IS represented the vast majority of JAI Iraq, leaving the remnant loyalists no choice but to quit the field, with the result that there have been no more releases in the name of a JAI Iraq, including a very significant break from previous years with the lack of an Eid al-Adha message or media release. Therefore, for all intents and purposes, JAI Iraq has ceased to exist. 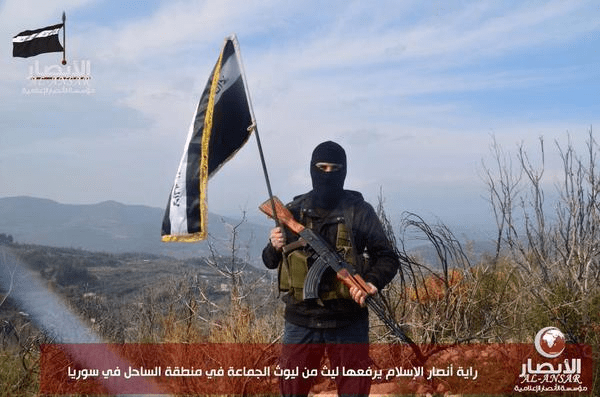 All this is in contrast with JAI's Syria branch, which had originally spanned the entirety of northern Syria but on account of conflict with IS became confined mainly to Aleppo and Idlib provinces, more recently making a claimed showing in Latakia province. JAI Syria, which put out photos for Eid al-Adha, continued to advertise its presence on the ground with photos displaying its banner and members via its official Twitter account @ansarulsham. JAI Syria reportedly in the 'Sahel' region of Syria (Latakia). Photo released last month by the @ansarulsham account. Indeed we give good tidings to the Islamic Ummah in the east and west of the land of the fact that 'JAI in Bilad al-Sham' is following the example of their brothers from 'Ansar al-Islam in Iraq' and so we announce our pledge of allegiance (bay'ah) to Caliph Ibrahim- may God protect him- the Caliph of the Muslims…And this pledge of allegiance is to be considered the dissolution of 'JAI in Bilad al-Sham' in answer to the command of God Almighty both to do away with division and unite the Muslims under one banner and Caliph who may implement the ruling of God's law in the land, declare all tyranny of idolatry to be disbelief, defend the sanctities of the Muslims, give victory to the Ahl al-Sunna in every region of the Earth, while not compromising his religion for the material world or bartering at the expense of the upright direction [program]. We have announced this pledge of allegiance and hope it to be a source of pain for all the disbelievers and hypocrites and a source of joy and happiness for all the Muslims. This statement is to be considered the last from the group in Bilad al-Sham and this account is the sole official account for the group and any statement issued after this number as false and coming from factions not linked to us (…). Leadership of JAI in Bilad al-Sham. "After we lost connection with our account @ansarulsham and until we recover it, we will tweet and work using this new account. And we inform you that the group is not responsible for what is published on the aforementioned account, including the last two tweets [from January 5 urging followers to expect a new release] and what will be published after. And the brothers are currently working to recover it, so until then this is our sole official account on Twitter." 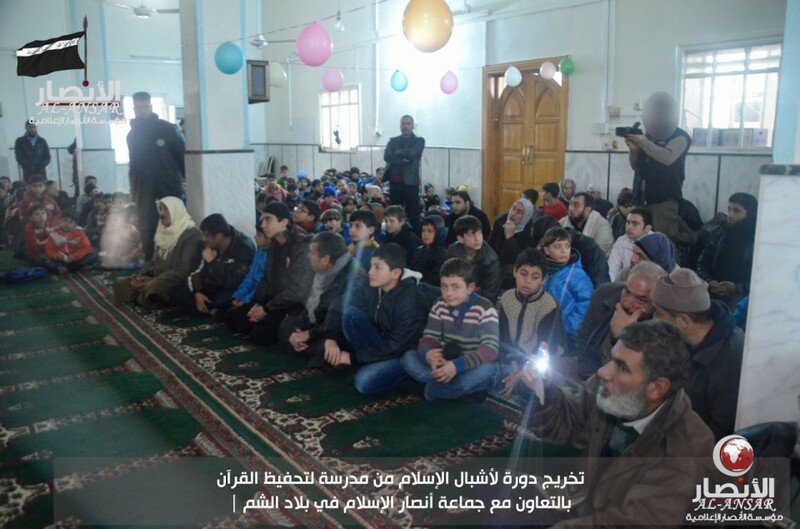 The account then published a series of images of a graduation of a new cohort of children from Qur'an memorization school- a program said to have been done in cooperation with JAI Syria. The date given is 17 Rabi al-Awal 1436 AH, though the corresponding Gregorian date given (4 January 2015) appears to be incorrect. Perhaps there is a confusion in that the photos may have been produced on 4 January 2015. So what is going on here? Which of the two accounts represents the majority of JAI Syria? Is this the end of JAI Syria? To answer the last of the above questions in a short phrase: probably not. To preface though, one should not give too much credence to Ansar al-Islam fanboy accounts like @ansaruna, who has his/her facts confused in claiming a logical contradiction between this purported allegiance to IS by JAI Syria and a supposed IS claim that 'hole [sic: whole] Ansar al-Islam give them bay3a [bay'ah]' 5 months ago. Actually, the original statement put out in JAI Iraq's name by the majority of IS loyalists in August 2014 never claimed the dissolution of all of JAI but only the Iraq branch, while urging the Syria branch to follow its example. In any case, the situation in Syria vis-a-vis JAI and IS is not exactly analogous to that in Iraq. In Iraq, territory can be divided three ways: Sunni insurgent control, central government forces control, and Kurdish control. For the non-IS insurgent groups in Iraq, the latter two do not offer a 'third way' of safety from the power of IS in the way that remaining rebel-held territory in Syria does. Already another notable difference exists in that the @ansarulislam_sh account is at least trying to substantiate JAI Syria's continued existence with visual evidence, something which the JAI Iraq remnants that controlled the official Twitter account failed to do after denying the statement of joining IS (with no subsequent statements, photos, videos etc.). Further, in Iraq, the eventual statement by IS loyalists in JAI Iraq did not come from nowhere but had rather been the product of two months of direct pressure on the group from IS' power with a series of pledges of allegiance first advertised by IS inlate June 2014. There is also the issue of practicality: being spread in Idlib, Aleppo and Latakia, would it be so easy for the entirety/majority of JAI Syria, if it merged with IS, to evacuate to IS-held territories? Here, some further context and clarification of the JAI Syria presence are needed. According to a Jabhat al-Nusra member from Aleppo with whom I spoke on my trip to the Azaz district last month (18th-22nd December), JAI Syria is thought to have "hundreds" of members and has been working with Jabhat al-Nusra on e.g. the contested Handarat front in Aleppo province. This is so even as some members of JAI Syria have given allegiance to Jabhat al-Nusra. Further, the spokesman of Northern Storm, which also fights on the Handarat front, claimed to me that JAI Syria is specially protected by Jabhat al-Nusra (I would add that there appears to be a close bond with the independent jihadi coalition Jabhat Ansar al-Din). Indeed, it was precisely my asking about JAI Syria that attracted the suspicion of Jabhat al-Nusra in the Azaz area, on the grounds that I might be gathering information on Jabhat al-Nusra and JAI Syria positions to hand over to the coalition. Yet the control of the @ansarulsham account by IS loyalists within JAI Syria's ranks could not have come from nowhere. Some serious defections have clearly happened. Indeed, Abu Obeida the Salafi- JAI's 'intellectual heavyweight' based in Iraq and still supporting JAI in Syria- wrote on Twitterbefore the issuing of the allegiance pledge by @ansarulsham: "How odd! Some[emphasis my own] of the soldiers and amirs from JAI don't know of the coming decision…." He thus concedes that the allegiance pledge has involved at least some commanders within JAI Syria. It is also evident here that IS has pursued the familiar strategy it applied to JAI Iraq and Jamaat Ansar Bayt al-Maqdis in Sinai/Gaza: that is, urging those within the group ready to pledge allegiance to issue a statement in the name of the entire group announcing allegiance in the hope of overcoming those who object. That some high-rank JAI Syria members might choose to join IS should not come as much of a surprise: similar defections have happened within Syria's other jihadi groups. But the evidence at present does not quite suggest that this latest IS move against JAI Syria is fatal. In short, expect JAI Syria's presence to continue on the ground for the time being, though it is possible that those from JAI Syria who have not pledged allegiance may end up fully merging with Jabhat al-Nusra and/or Jabhat Ansar al-Din if it is felt the group's continued existence is an unviable project. On the whole, looking at the big picture in Iraq and Syria, JAI is a mere shadow of its former self. H/T to my friend and colleague Caleb Weiss for drawing the @ansarulsham statement to my attention and first raising the questions that led to the genesis of this article.